When it comes to fall and winter I love a good bold vampy lip. I have to be honest at the start when I started wearing lipsticks I hated purple and could not understand how someone can wear a purple lipstick on lips, but you just have to try it. Since I wasn't so daring first lipstick I ever got from purple family was Plumfull,I tried wearing it and I did not like it so left it behind for a really really long time. 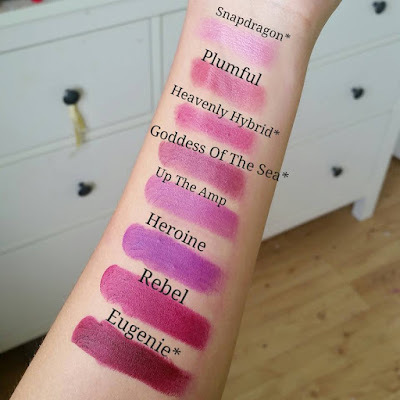 A collection came out from Mac that had Snapdragon* and Heavenly Hybrid* and I decided to give a go for purple again and I fell in love with the color and then Heroine, Up The Amp, Rebel and Eugenie* cam into my collection. It takes to try the right lipstick to like the color range and I had exactly the same experience with most of colors. Mostly I think it was because I was afraid what people will think of me walking down the street with purples or orange or any color lips, but when you learn not to care what others think life becomes easier, believe me I walk around town with blue, grey, black lips and deeply do not care what anyone thinks because, I like it and feel comfortable wearing those colors. 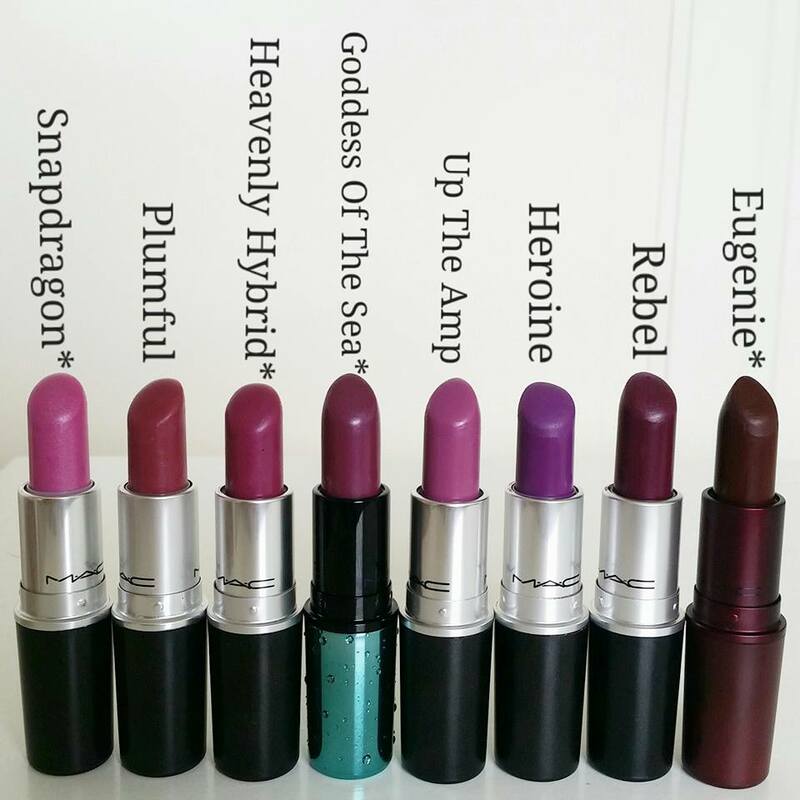 My favorite from these would be at the moment Eugenie*, Up The Amp, and Heroine with Rebel make the top. For those who just want to try out purple since 3 of the lightest colors are limited edition try Plumfull, since it is Luster it wont give you in your face color you can apply it lightly or build up the color, or maybe go into Mac store and ask them any other light purple color.